The results of these scenarios are sensitive to the underlying assumptions on economic growth and (implicit) interest rates. They are based on pre-crisis calculations, and their actual values may differ substantially in the aftermath of the crisis. However, they may well serve to illustrate the increased risks to fiscal sustainability in the euro area stemming from a rapidly rising euro area government debt-to-GDP ratio. 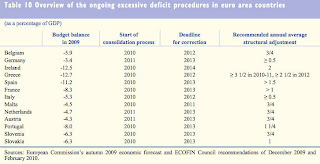 Unchanged fiscal policies (i.e. 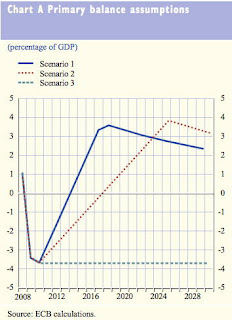 Scenario 3) would pose a clear threat to the longer-term sustainability of public finances. These risks may be compounded by negative feedback effects if rising government debt ratios were to trigger higher real interest rates and/or reduce economic growth. 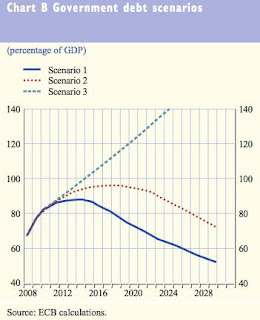 The true risks to fiscal sustainability are even more pronounced, as the three debt scenarios take into account neither the projected rise in ageing-related costs, nor the risks associated with contingent liabilities stemming from the guarantees provided to the financial and non-financial sectors in the context of the crisis. However, banks may still be faced with further write-downs3 and, after 2020 in particular, strong pressures on public finances are to be expected on account of ageing populations. It should be clear by now that Eurozone governments have no other option than to enter into a competition for new debts. 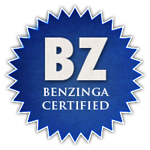 It will come at the price of dramatically rising sovereign yields.